The creators of ModNation Racers show off their reboot of the True Crime franchise. You may think you know a bit about True Crime already, but United Front Games' reboot of the franchise is being reshaped with some very particular goals in mind. The new game takes place in the city of Hong Kong, where East meets West and massive modern skyscrapers stand beside old world fish markets. This unique fusion allows for a great deal of variety in terms of location and mood and helps, it's hoped, to place the city as sort of the central character of the game. It's worked well for locations like Vice City and San Andreas in the past and that seems to be the approach United Front Games is taking. While driving and vehicle combat is a big part of the game, it's equally important that the game be fun on foot. 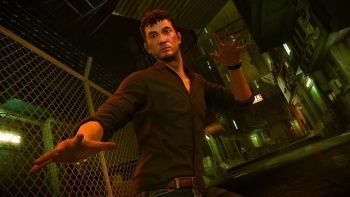 Not only does the game use martial arts moves and a system of grapples and counters, but it also gives players the chance to use a Parkour-inspired free running system that nicely recreates the feel of classic cop chases like those in Blade Runner or Se7en. True Crime also includes a social system based around the concept of 'face' or reputation. Your face level is determined by your decisions and actions throughout the game; you lose face, for instance, for accidentally killing civilians, but you can gain it for pulling off cool Parkour moves. Your face level will affect how (and even which) NPCs will react to you, which missions you can access, and even how well you perform certain skills. You'll be playing as undercover cop Wei Shen. Wei Shen was raised in San Francisco after his family fled Hong Kong following some unnamed tragedy. Now Wei Shen is back in Hong Kong, working undercover to infiltrate the Triad. We saw one level where Wei Shen was tasked with collecting a debt for the Triad. The sequence consisted of a few lengthy chases through the markets of Hong Kong with Wei Shen using his Parkour techniques to avoid obstacles and close the distance with his target. Periodically, the target would lead Wei Shen into confrontations with other gang members. The combat in the game looked fairly similar to Batman: Arkham Asylum, which isn't a bad thing. Timing your counters when you see enemies getting ready to attack is about the only way to handle fights against multiple opponents. Grappling plays a big role as well, and you'll be able to smash enemies into nearby obstacles and even toss them off of roofs. True Crime's pedigree is fairly obvious, but that shouldn't be a surprise considering the experience that developers have had with other successful open-world games. The gameplay seems to have all the elements in place, so we're hoping that the story and content also delivers.